How many sensors (feedbacks) per block make sense? Note: The route tab will be disabled in case of a modular layout. Select the route to setup the events for that route. The all enter + Route can be used as a default for all routes entering the PLUS(+) side. The all enter - Route can be used as a default for all routes entering the MINUS(-) side. If other sensors are used for a Specific-Route, then these sensors override the sensors in the General-Route. However all other Routes still use the sensors defined in the General-Routes. The use of the General-Routes (+ or -) significantly reduces the number of sensor entries to be made, especially when several Routes lead to a Block. Select the sensor ID to use from this combobox. Select the event for the sensor. [empty] - without assignment to an event, usable for locomotive functions. See: Sensor without event. Events maybe multiple defined to enable multiple sensor systems like magnets and current detection. A sensor, which is assigned to the block without event, are passed the parameters for actions. This provides the information about the current locomotive triggering the sensor (%lcid%) in order to trigger a loco function (whistle, high beam on, etc.). It is irrelevant whether this sensor is arranged before or after the block. It should be noted, however, that all sensors assigned to the block are checked for "free". Without occupancy or reservation of the block, the triggering of this sensor also generates the state GHOST. Deprecated and no Forum support. Trigger at the down flank of the pulse. Better do not use this unless you can make sure the pulse will not have any disturbance. By using the up and down flank you can use one sensor generating two events. "Event timer 2" will be used if this option is activated. Calls the properties dialogue of the sensor defined under ID in this line. Time (in milliseconds) the events specified above will be delayed. 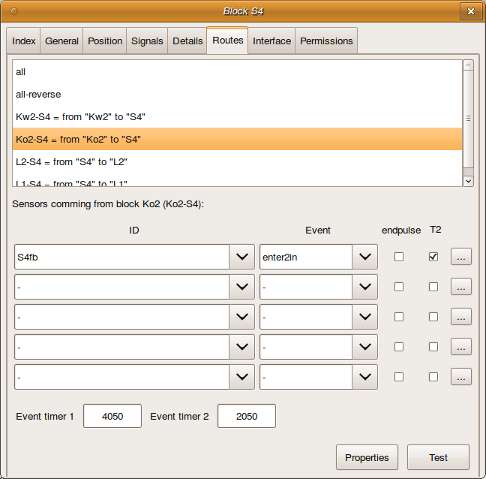 Event timer 2 is used for events with option T2 activated only. For details see chapter Event timer below. Overrules the optional loco event timer. This flag is only evaluated if the global flag in the Rocrail options is not set and will be only active from this block to the next. This option can be used to share sensors between blocks. Ghost detection will not work if this option is set; Use only in case it is really needed. Shows the properties dialog for the selected route. With the Test button you can activate all switch and output commands for the selected route. Advice: Use BBT instead of timers. Event timers can mix up the actual sequence of events which leads to unexpected automatic behavior. Use with care or use real sensors instead. All event timers must be set to zero or reduced to a minimal value before reporting any problem in the Forum regarding unexpected event warnings. enter None, enter events will not be delayed. enter2in Delay between events enter and in. pre2in Delay between event pre2in and speed Vmin. If a block contains the feedbacks enter and in then a third feedback pre2in is simulated. The enter is immediate, but the pre2in trigger follows after the time in ms.
in Delay between events in and speed 0. If the timer is set too long the in event will get delayed. Force delay with "Block timer"
When a value is zero, then the next value is checked. If a value greater than zero, then this value is used and the series is ended. A enter2in event is evaluated as 2 events first an enter and then an in. Rocrail revision 1573 or higher allows for fine tuning of the stopping point. There are two event timers. 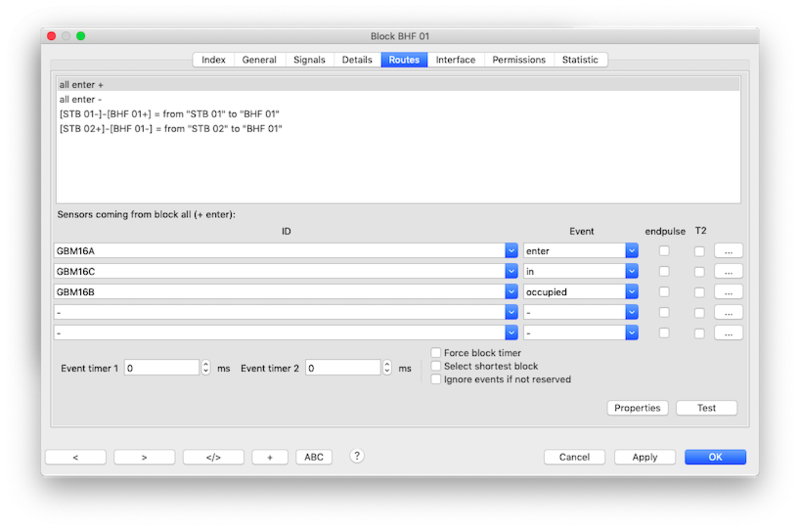 This allows for asymmetrical stopping in the block when using the enter2in event. An example where this option is useful is a station block where the platform is not in the centre of the sensor section. By using this option different event timers and thus different stopping points can be used for trains entering the block from the right and from the left. For every route the tickbox T2 determines if "Event timer 1" (T2 not ticked) or "Event timer 2" (T2 ticked) is used. The tickbox is only evaluated when the event is an enter2in, enter2pre or an in event. The in event, regardless when it comes from a real sensor or when it is generated by the enter2in sensor, is delayed by the selected event timer. The value of the event timers is specified in milliseconds. In the loco properties Loc details fine tuning for the selected event timer due to differences in characteristics of different locos is possible. Note: Contrary to previous revisions, the event timer is not only effective for the enter2in event, but also works for a real in sensor. When using schedules, if an in delay is specified, this takes preference over the block event timer. Also, when an event timer is specified in the loc properties, this also takes preference over the block event timer, but not over the in delay in a schedule.